Congratulations to our 2018 Winners & Honorees! Alex, age 17, of Texas, who founded Health Through Science, a non-profit working to eradicate preventable diseases — especially pediatric Type 2 Diabetes and obesity — by matching high school-age science coaches with underserved elementary students. Armando, age 18, of Illinois, who created the Bridge Tutoring Program to pair young students in under-resourced urban communities with high-achieving high school-age mentors who offer free, weekly, after-school tutoring. Bria, age 11, of South Dakota, who founded Faces of the Endangered to protect endangered species through the sale of her artwork. She has sold more than 250 paintings of endangered animals and donated over $33,000 to animal conservation groups. 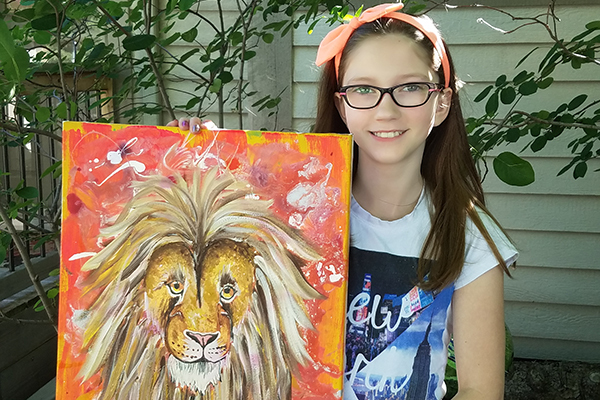 2018 winner Bria with her painting titled Mufasa. Claire and Mercedes, age 17, of Maryland, who co-founded Baltimore Beyond Plastic to reduce trash and plastic pollution in their city on the Chesapeake Bay. Their non-profit of more than 500 students has convinced the Baltimore City Council to pass a citywide ban on Styrofoam food containers. 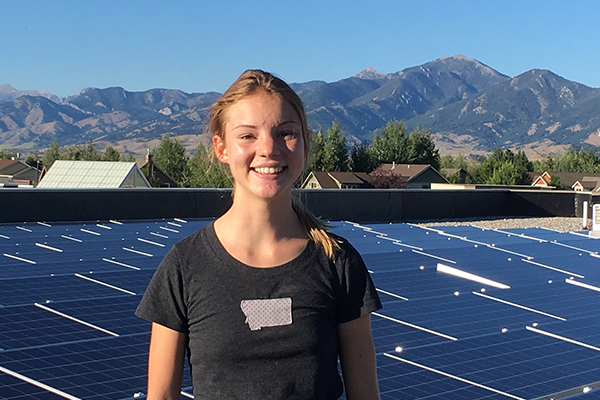 Claire, age 15, of Montana, who created the Solar Makes Sense initiative and raised the $118,000 needed to install solar panels on her middle school. She has sparked a movement in her school district and community, inspiring a new commitment to green building. Genevieve, age 12, of Quebec, who created Milkweed for Monarchs to help protect migratory monarch butterflies. She raises and plants native milkweed – monarchs’ sole food source during their caterpillar phase – and has logged more than 500 hours conducting research on the butterflies. Harry and Heath, ages 13 and 9, of Massachusetts, who co-founded Bennett Brothers Balm after learning of their young friend’s cancer diagnosis. The brothers have raised more than $12,000 to support pediatric cancer research through sales of their hand-made line of lip and body balms. 2018 winner Tabitha and her Puppy Paws mentoring program table. Isaiah, age 18, of California, who founded the San Diego Chill, a non-profit that pairs children with developmental disabilities with high school-age mentors who teach the younger kids how to skate and play ice hockey. Kenzie, age 13, of North Carolina, who founded the non-profit Make a Difference Food Pantry to provide nutritious food in a compassionate setting for those in need. She has distributed more than 600,000 pounds of food to over 400,000 people. Marcus, age 16, of Ontario, who has invented the NOGOS water filter for use in developing countries. His filter costs just $2.00 to manufacture and is made from three readily-available materials — sugar, sand, and seashells. Robbie, age 10, of Hawaii, who created Kids Speak for Parks, a non-profit that is building an army of activists, including fourth-grade students (who can visit our national parks free of charge), who will speak up to protect our national parks and monuments. Robby and Emma, ages 16, and 12, of Michigan, who founded the non-profit Eimers Foundation to help people in need. They have raised more than $80,000 to fund their weekly Sharings for the homeless, distributing food, blankets, and other necessities. Shelby, age 17, of California, who founded her non-profit Jr Ocean Guardians to educate young children about ways they can protect our oceans and planet. She also created the #NoStrawNovember movement and is working on legislation to eliminate plastic straws in California. Shreya, age 14, of California, who founded a non-profit called The Grey Water Project to promote the safe reuse of grey water, along with water conservation, as a way to address drought. Her outreach includes curriculum for elementary students and a partnership with the United Nations’ Global Wastewater Initiative. 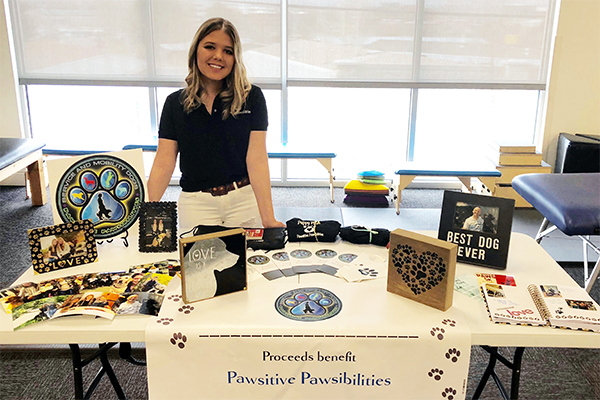 Tabitha, age 18, of Utah, who founded Pawsitive Pawsibilities, a non-profit that has raised more than $130,000 to place nine service dogs free of charge with people challenged by physical disabilities. Angus, age 17, of New York, who has developed a sustainable method to address declining bee populations in colonies that has been adopted by more than 300 farms in New York and Massachusetts. Gitanjali, age 12, of Colorado, who has invented an easy-to-use and inexpensive device to detect lead contamination in water. Haile, age 17, of New York, who founded the non-profit HAPPY Organization (Happy Active Positive Powerful Youth) and has provided plant-based nutrition and culinary programs to more than 15,000 children. Khloe, age 11, of California, who founded Khloe Kares to help women who are homeless. She has sewn and distributed more than 1,600 sturdy tote bags filled with toiletries and other daily essentials. Maxwell, age 14, of Massachusetts, who co-founded Catching Joy to promote volunteerism and has mobilized more than 60,000 youth to join him in service projects and acts of kindness. Meagan, age 15, of Ohio, who founded her non-profit Books for Bedtime to support children’s literacy and has distributed more than 77,000 books to schools, homeless shelters, and food pantries. Olivia, age 17, of Massachusetts, who has invented a renewable energy technology (and received a provisional patent for it) that captures kinetic and thermal energy from highways and converts it to electrical energy. Reagan, age 11, of Delaware, who founded the Buckets of Love Foundation to provide games, crafts, and puzzles to young children facing a medical challenge or some other hardship. She has distributed nearly 1,500 buckets across Delaware and the U.S.
Ryan, age 9, of California, who created Ryan’s Recycling Company and has personally kept 76,000 pounds of pollution out of the ocean and our landfills.